Given coordinates of 4 points, bottom-left and top-right corners of two rectangles. The task is to find the coordinates of the intersecting rectangle formed by the given two rectangles. As two given points are diagonals of a rectangle. so, x1 < x2, y1 < y2. similarly x3 < x4, y3 < y4. so, bottom-left and top-right points of intersection rectangle can be found by using formula. In case of no intersection, x5 and y5 will always exceed x6 and y5 respectively. The other two points of the rectangle can be found by using simple geometry. // rectangle of given two rectangles. // function to find intersection rectangle of given two rectangles. 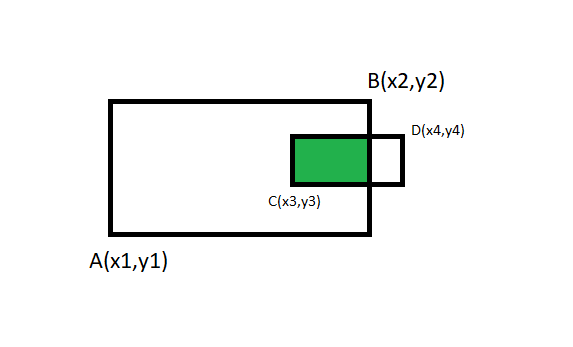 # rectangle of given two rectangles.